AWESOME CONDITION FOR A 1920'S -1940'S PIECE! 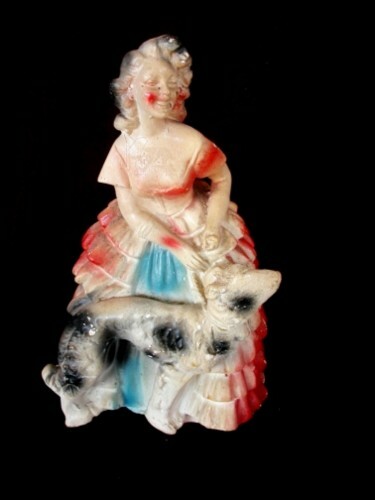 You are viewing An Outstanding "Carnival Chalkware Lady Chalkware Prize" in Very Good Condition! This is one of the prizes given out at Carnivals in the 1920's, 30's and 40's! This particular lady and dog is in good condition for chalkware and has only the normal wear and tear from being shelved all these years. The "Big Prizes" that were given away at Carnivals are highly sought after and this particular one is a great find being one of probably a matching set to be used as a major prize! There are a some places that are chipped away but not really major for this piece. The photos will show where the blowmold of the chalkware is gone(such as on the lady's cheek) and where the chips are in the piece. There is a good bit of color missing on the piece, but you can see that on the photos. The lady is a commanding 10 ½" tall, is 16½" all around the base. This was a BIG PRIZE in the Carnival World. Any wear and tear are shown in the photos. This is going to be one of the more prime pieces in Carnival Chalkware and we here at Andtiques is offering this for a very nominal price. I have several here so please see our other Andtique Carnival Chalkware for descriptions and selection. This color, beauty, and condition is a great addition to your collection or for your display. A real conversation piece. Please see the photo showing the size as compared to an average ink pen. Please contact us with any questions or needs concerning the piece. You may use the online support button to talk with us or leave a message or you may contact us via email or phone. We always answer immediately upon receiving communication.